hillviewasb.com: Color Team Competition returns to GRADE levels! Color Team Competition returns to GRADE levels! It is we great excitement that your ASB present to you the 2013-2014 ASB Spirit Competition! We ask that you take a minute to review this blog and soak in the changes. This year's theme is "Ready to Rock!" and this year's spirit competition is putting the power back in the hands of each grade level! That's right…this year, the GRADE LEVELS will be on the same team and facing off against each other….. 6th vs 7th vs. 8th! Why the change? We feel this change…or change back... will bring about more spirit and camaraderie from the student body. ASB will also continue to reward participation as we did at last year's Hawkapalooza. Most importantly, we will continue Academy competitions for extra rewards and privileges. Get Pumped! Get Involved! Get Ready to Rock! What do we have planned so far? Pretty much everything else about our competition has stayed the same! Spirit points will be awarded and updated on our website. We will always strive to reward participation first when appropriate, but will sometimes also reward victories in competitions. Each "major" competition such as the food and toy drives will come with its own set of rules e-mailed ahead of time. Keep it fun, keep it fair…our top priorities. Which grade level will be taking the day off and chillin' out at Raging Waters? Which class has what it takes to win? 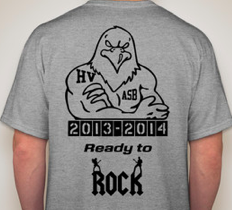 2013-2014 ASB Spirit Competition: Ready to Rock! Can't wait to see who wins for this year! Raging Waters, here we come! It's going to be a tight competition this year, so good luck teams! The Winning ASB Shirt Design!